Mark Wahlberg stars in 'Deepwater Horizon,' the best action movie of 2016. I remember when ER first premiered. There was a lot of chatter in the media about how the show threw in a lot of medical jargon without dumbing it down for the masses and without giving unrealistic exposition. If you work in an emergency room, of course you know all the jargon and you don’t need an explanation. Because of or despite ER’s abundance of medical jargon, the show was a huge hit even though 95% of its viewers had no idea what many of the jargon meant. This is probably due to the fact that you feel like you’re in the emergency room with George Clooney and Julianna Margulies. Though I’ve been in emergency rooms, I’ve never been anywhere near an oil rig. Was there a lot of oil rig jargon in Deepwater Horizon that I didn’t understand? Yes. Did I care? Not one bit. Like ER, you feel like you’re on the oil rig with Mark Wahlberg and Gina Rodriguez. We usually watch action and disaster movies with a sense of amused detachment. Watching Deepwater Horizon, there’s no amused detachment. That’s what gives the film its power. This isn’t a superhero saving the day. These are real people who find themselves in a harrowingly real, life or death situation that played out in real time on the 24-hour news cycle. Based on the true events that occurred on an oil rig in the Gulf of Mexico on April 20, 2010, the story chronicles the courage of those who worked on the Deepwater Horizon. We all know that 11 men lost their lives in the accident and that the ensuing oil spill became the country’s all-time worst ecological disaster. Director Peter Berg and Wahlberg reteam after their successful collaboration on Lone Survivor. They have two more films in the pipeline. As entertaining as both films were, I’m looking forward to their future projects. In fact, Berg was a last minute replacement when J.C. Chandor left the project due to creative differences. 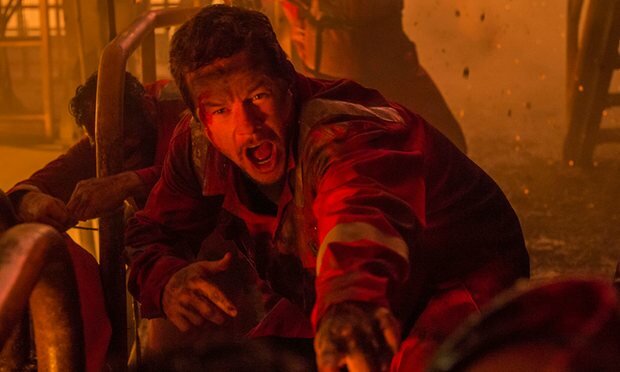 Many people might assume that the film sets out to vilify BP, but really it’s a tribute to the men and women stuck on-board the Deepwater Horizon when things went bad and their heroism in saving as many lives as they did. Just like the disaster epic, Apollo 13, the human characters remain the focus, even as the surrounding spectacle threatens to overwhelm them. Wahlberg plays chief electronics technician Mike Williams, who puts others’ safety before his own while his wife does the worrying back home (one of Kate Hudson’s best performances since Almost Famous). This is another similarity to Apollo 13 as Kathleen Quinlan does the worrying on Earth as Tom Hanks is saving the day out in space. Sure, most of us aren’t engineers, so don’t worry if the jargon has turned you off at the beginning. When disaster happens, everyone shifts in to survival mode. You might not be able to relate to an engineer, but you can surely relate to a fellow human being trying to survive extraordinary circumstances. If anything, Berg’s organized disorganized directing style adds to the movie’s effectiveness. While the editing keeps us constantly disoriented, the hyper-real, sound design often drowns out the dialogue – you feel like the chaos and explosions are happening right around you and not just on the screen in front of you. Deepwater Horizon barely touches on the catastrophic economic and ecological impact. I’d love to see a movie about that. It could be an interesting double feature just like The Big Short and 99 Homes are great movies about the lead up to and the fallout from the 2008 financial crisis respectively. While certainly worth the ticket price, the film’s happy ending is one of the unhappiest beginnings in environmental history. And though the ending is happy, if you’re a crier, be sure to bring tissues. While the action is certainly visceral, the emotions are not manipulative, but genuinely real. Deepwater Horizon opens in theaters September 30th.